The firm secured a number of favourable awards for its clients this year as well as obtaining a number of new instructions. South Korean firm Bae, Kim & Lee got serious about arbitration in 2002 at the suggestion of young partner Kap-You (Kevin) Kim. Since then, it has gone from respected co-counsel working with the big international names, to being one of those big names. It did so in part by creating its own local opposition: each time Kim took part in an international case, he convened an event to share know-how with local rivals. Together, they promoted use of arbitration to their clients and an arbitration culture quickly developed in South Korea. Nowadays Bae, Kim & Lee sits at the heart of Seoul’s impressively busy arbitration scene. With 30 specialist lawyers, including eight at the partner level, qualified in Korea, Australia, England and Wales, Singapore, Pakistan, India and the US, it is one of the largest dedicated practices in Asia. 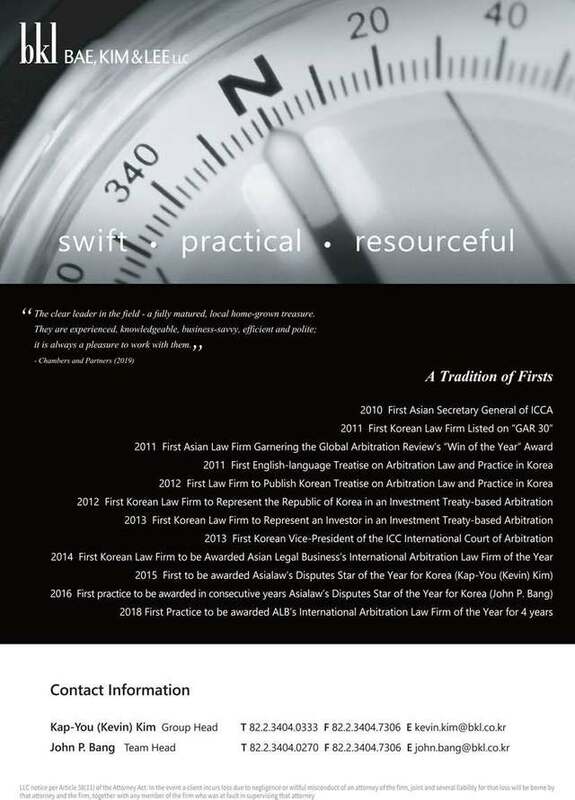 Its members are highly visible locally and internationally: the firm has a task force aimed at assisting clients caught up in litigation abroad, particularly in the US, and Kim is acknowledged to be a driving force behind Seoul’s effort to become an internationally recognised seat. The quality of its work has been summed up by Jan Paulsson as “worthy of Freshfields”, his former firm. Bae, Kim & Lee also produced the first English-language textbook on the law and practice of arbitration in Korea (along with a similar volume in Korean), and hosts the annual Seoul Arbitration Lecture, attracting speakers of the calibre of David W Rivkin and Gary Born. Having headed the firm’s international arbitration practice group since its inception, in 2015 Kim became head of international and domestic disputes but has now left that role to concentrate on his work as arbitrator and counsel, alongside his other roles including as a vice president of the ICC court, a member of the ICCA governing board and as chairman of the international arbitration committee of the Korean Commercial Arbitration Board. The international arbitration practice is now headed by its other co-founder, partner John Bang whose broad practice covers investor-state disputes, construction and engineering disputes and commercial arbitrations. Bang is a board member of the Korea Council for International Arbitration and a member of the SIAC users council. The international arbitration practice now prides itself on its expertise in two areas that were not previously catered for by Korean law firms: international construction and engineering claims and investor-state disputes. The firm often acts as sole or lead counsel in large scale construction claims arising from projects situated abroad and governed by foreign law. In the investor-state arena, after being appointed by South Korea in the first ever ICSID claim against the state, the firm has since gone on to represent several Korean corporations in investment treaty claims against foreign governments. Meanwhile, South Korea has appointed the firm once again to represent it in an investment treaty claim brought by a Swiss company. The team’s partners have begun to develop specialisms: Seung-Hyeon Kim and Matthew Christensen in construction (Kim has extensive in-house experience in Korean construction and engineering companies including Samsung and Hanwha Engineering, while Christensen is the vice chair of the International Construction Projects Committee of the Inter-Pacific Bar Association), and David MacArthur in commercial disputes and engineering. The arbitration practice is overwhelmingly Seoul-based, but the firm has long-standing offices in Beijing and Shanghai, and in recent years has opened in Dubai, Hong Kong, Hanoi, Ho Chi Minh City and Yangon. Thanks to its incredibly strong brand, Bae, Kim & Lee is one of the first ports of call for South Korean entities facing foreign arbitration. Many are construction firms and automotive parts makers. Clients have included Daewoo, Dongkuk Steel, Hyundai Heavy Industries, Doosan Heavy Industries & Construction, Lotte Engineering, Keangnam Enterprises, Korea Exchange Bank, satellite operator KTsat, LG Display, Olympus, Samsung, Stryker Sales, Daehan, Woori Bank, Hanwha, POSCO Group, Hyundai Home Shopping, Huyundai Engineering and Steel Industries, Pyunghwa Holdings, Korea Electric Power Corporation and Korea Hydro & Nuclear Power. The firm launched what it suggests is the first ever investment treaty claim by a Korean investor against an African state. It is also co-counsel to the Korean government (alongside Arnold & Porter Kaye Scholer) in the first ever investment treaty claim against South Korea at ICSID, filed by US-Belgian private equity fund Lone Star. It was also counsel to the organising committee of the 2018 Winter Olympics, which took place in the Korean resort of Pyeongchang. Along with Debevoise & Plimpton, the firm picked up a GAR Award in 2010 for its work on behalf of Hyundai Heavy Industries in an ICC dispute worth US$2.3 billion. It helped the client to enforce a punitive call-option in a joint venture agreement, thus allowing it to obtain full ownership of an oil refinery at a sizeable discount. There have been plenty of favourable awards since. In 2011, the firm secured a victory for LG Display in an ICC claim worth over US$100 million brought by a well-known Japanese company over intellectual property. The firm succeeded in having the claims against its client dismissed and the majority of arbitration costs awarded. In 2016, it defended a Korean state-owned enterprise from a US$180 million claim over its alleged failure to perform obligations under a government procurement programme. With co-counsel Addleshaw Goddard, it prevailed in 2015 in a US$100 million ICC case relating to a power plant project in the Middle East after succeeding in an interim application to restrain a threatened bond call. The same year, it successfully defended a subsidiary of Korea’s largest electric utility against a US$50 million claim by a US supplier of nuclear power plant components, winning full costs. In 2017, the firm won a SIAC arbitration for a longtime engineering client over a high-rise construction project in Mongolia, acting as sole counsel. Again as sole counsel, it achieved a favourable settlement in a three-party shipbuilding dispute heard at the LCIA; and in a Singapore-seated ICC case, the firm won a US$53 million award for a Lotte entity in a post-M&A dispute relating to a Chinese hypermarket chain. The firm won a case for a major Korean steel company in SIAC arbitration seated in Singapore. The dispute arose out of an agreement for the supply of structural and other steel to an Australian company in relation to the construction of a large civil engineering and construction project in Australia. The tribunal found in favour of the firm’s client on almost all issues, and issued an award requiring the Australian company in question to pay substantial sums to the steel maker, including 70% of its costs for the arbitration. The award is the subject of challenge proceedings in Singapore, as well as enforcement proceedings in Australia. In another SIAC arbitration seated in Singapore, the firm, as sole counsel, secured a victory for a Korean home-shopping company. The dispute involved an agreement for a major, long-term joint venture in China between the Korean company and the Chinese joint venture party. The firm’s client received all its legal and arbitration costs, in addition to the damages arising out of the breach of the joint venture agreement. Bae Kim & Lee also saw good results in two ICC cases. It helped a Turkish client defeat a claim filed by a South Korean governmental authority over a supply contract for military training systems and software. As well as dismissing the government authority’s claims, the tribunal granted the Turkish company’s counterclaim for outstanding payments under the contract. In another ICC case, seated in Bangkok and under Thai law, it obtained a favourable outcome for a Korean engineering, procurement and construction contractor in a dispute with a Thai subcontractor concerning one of Thailand’s largest chemical plants. With regard to new instructions, the firm was instructed by South Korea to represent it in a US$300 million investment treaty claim filed by Swiss-based elevator maker Schindler over its investment in Hyundai Elevator, which it says has been damaged as a result of South Korean financial authorities’ failure to supervise capital increases by the company. It was also instructed in a number of commercial disputes including by a Korean software and videogame development company to hear an ICC claim seated in Singapore, and by a Korean automaker to hear an ICC case seated in Frankfurt relating to a distributorship agreement in Latin America. The firm is also representing a major Hong Kong-based real estate development company in a claim against a Korean government-related entity in connection with alleged breaches of a joint venture agreement for the development of a mega real-estate project in Korea. Meanwhile in the construction sphere, the firm was hired to represent a major Korean construction company in a SIAC arbitration seated in Singapore against a Finnish construction company. The claim relates to a consortium agreement for the construction of a major power project in North Africa and involves a claim against the firm’s client in excess of US$30 million. Partner Sue Hyun Lim left the practice to join the new international division of the Korean Commercial Arbitration Board as its first secretary general. Seokchun Yun, who joined the firm as an associate in 2011, was promoted to partner. An IP client that hired the firm for a complex arbitration spanning multiple jurisdictions says the firm’s “extensive experience” allowed it to manage the nuances of the case, which was “fundamental” to the company’s future business strategy. “They did an outstanding job,” the client says.